I've been a bit absent lately. I've been dying to get on here and get my next post in because it's about one of the best things in life. Kitchen gadgets. Sadly, one of the inspirations for my blog has been struggling to get to sleep at a reasonable time for me to make a post. This is my new set of scales. It's a Salter digital one. I was very excited buying it. It's a space saver too as it could replace my two plastic measuring jugs - it weighs in liquid as well as solid. Now I just put the bread pan on the top of the scales and add the ingredients, resetting to zero after each one. I just have to be a little cautious with my pouring, I've had to spoon out some ingredients when I've overdone it. This is my other recent purchase related to breadmaking. It's a cooling rack. I love the fact that it folds away (and makes an interesting triangle shape). This Cooling rack came from an excellent little shop that has opened up in Reading called Clas Ohlson. It sells a really wide range of stuff, a bit like a more gadgetty version of Ikea. 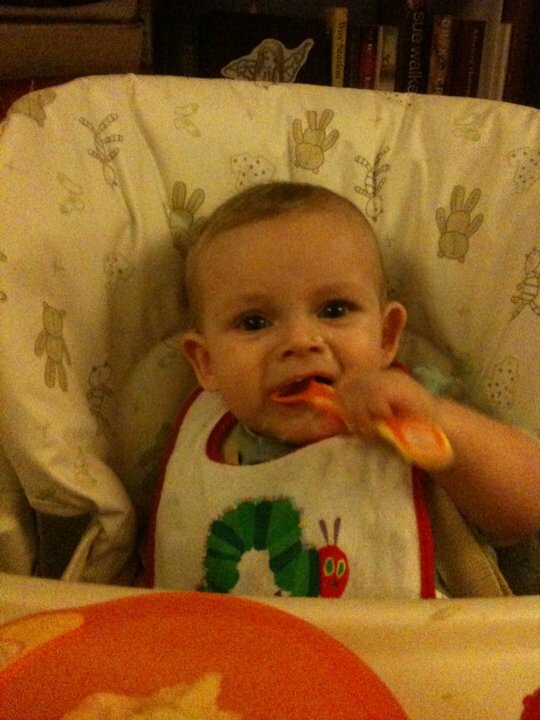 Also of note, Daniel is now starting to feed himself. It has happened really quickly. 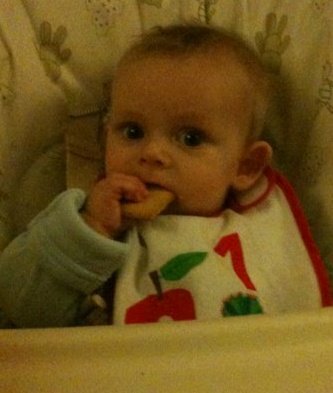 He's managed to feed himself some pear, some apple, some baby biscuit and is also able to feed himself using a spoon. It's quite quite magical to watch. I can't believe a six month old can be that aware.